The Chang and Chock family enjoying a day at the Ala Moana (Akana) Salt Ponds. Picture was taken about 1924. Wash and remove the seeds and stems from the chilies. Heat wok on low and add oil for stir-frying. When oil is ready, add the chilies. Stir-fry until they are heated through. Remove the chilies from the heat and drain. Dry in the sun until completely dried (about 2 – 3 days). Reconstitute conpoy (dried scallops) by soaking in water for 2-3 hours, then steaming for 3 hours until soft. Reserve the liquid accumulated as a result of steaming. When cooled, finely shred the conpoy by hand. Soak the tiny shrimp in water for 3 hours. Drain the shrimp and mince finely. Finely dice ham into 2mm cubes. Dice fish into 3mm cubes. Heat wok on high heat and add up to 2 – 4 cups* oil for frying. Add garlic, onion, and tiny shrimp and fry until the mixture stops steaming? At that point add the chilies, ham, and fish, and continue to cook until chilies become translucent. Add the conpoy and shelled dried shrimp and ground black pepper and turn the heat down to low. Continue to cook until only a little steam rises from the mixture. Remove from the heat and cool. Store in a sealed container in the refrigerator. *1 bowl = approximately 1 cup. In this recipe I would recommend starting with a smaller amount of oil and increasing as desired for taste. another from goodfood.com xo sauce. has photos and how to make crispy pork. XO is a spicy seafood sauce that originated in Hong Kong and is commonly used in Chinese cuisine. For many Jewish families, Christmas means enjoying each other’s company over Chinese food and movies (among the only businesses open in otherwise eerily abandoned ghost towns on Christmas Eve and Day). At his nationally recognized West Newton bistro Lumière(accolades from Bon Appétit, Food & Wine and Saveur), Michael Leviton is recreating this long-standing Jewish Christmas tradition featuring interpretations of Chinese food using local, sustainable ingredients and classic French techniques on Christmas Eve. Leviton’s homemade XO sauce, a salty-savory-sweet Chinese condiment made from caramelized dried seafood and sausage, is a great match for pork belly, scallops and a range of other Chinese dishes. You’ll notice that the XO sauce calls for house-dried seafood, but the home chef can buy this all at a well-stocked Asian market or by hunting around online Asian food sites. Cover the dried seafood with boiling water and rehydrate overnight in the refrigerator. The next day, drain the water from the seafood. Render the fresh sausage carefully, going for a deep golden brown without burning. Pour off the fat except for 1/2 cup. Meanwhile, purée the seafood in a food processor until finely chopped. Reserve. Once the sausage has caramelized, add the red pepper and cook 30 seconds, then add remaining ingredients including the reserved 1/2 cup sausage fat (but not the sesame oil) and cook very slowly, stirring frequently. The idea is to lightly caramelize the entire mixture slowly over 20-45 minutes. Once desired coloration has been achieved, add sesame oil. Combine well and adjust seasoning. 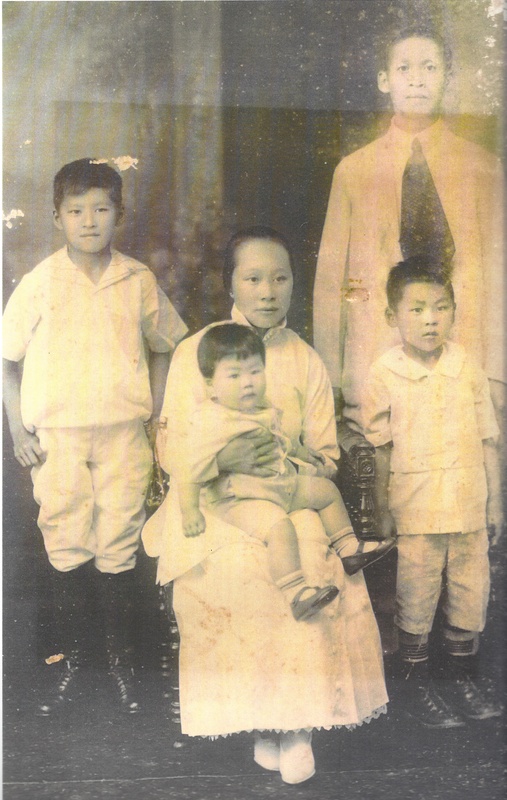 This is my Popo and GungGung’s family including my Father Gordon Yen Hoi Chang as a child. It is without my Aunty May Blossom. This picture is about 1918. Left to Right: Jack Chang as a student of Saint Louis High School. Popo (Chock Pang Chang), Gordon Chang in her lap. Humphrey standing in front of Chang Ah Gett (my GungGung). 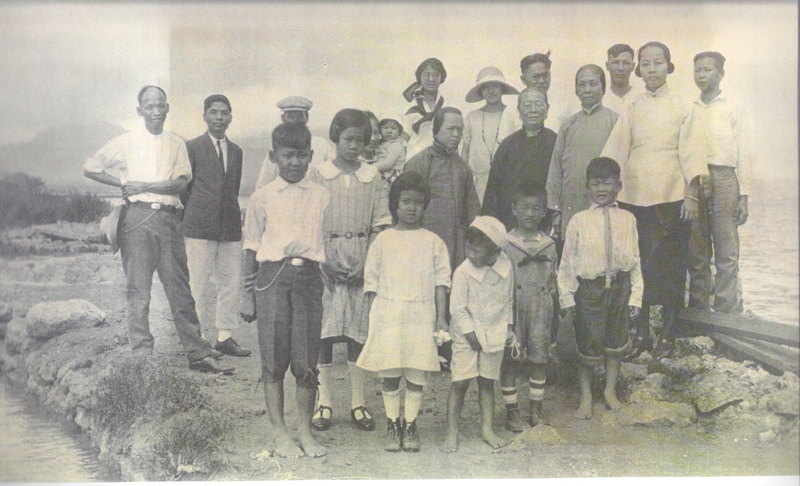 This photo was taken about 1912 of Chock Sai Shee(See)’s extended family. Chock Hinn is not in the photo as he passed away. 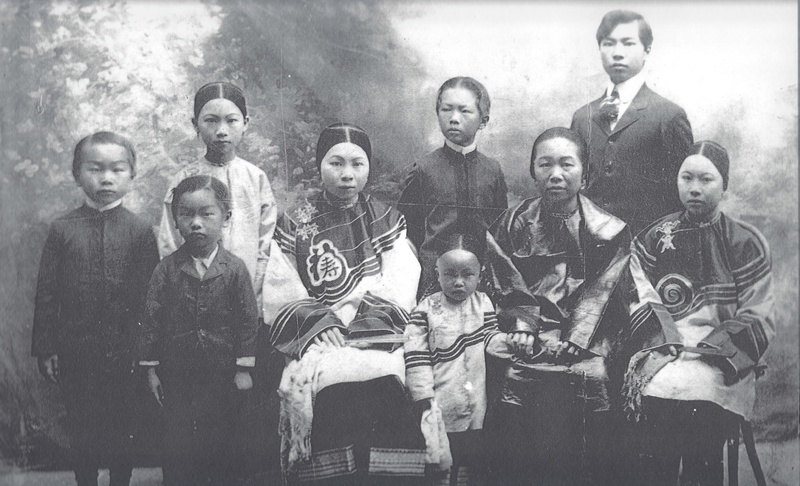 Seater: Diana(2nd daughter of 1rst sister), Bernice(youngest daughter), Jack Chang (1rst son of 2nd sister), Kam Pung (my popo), Chock Sai Shee, 1rst Sister, 3rd sister, Lena (oldest of 1rst sister). In Front: Mary (3rd of 1rst sister), Ah Kwock (1rst son of 1rst sister). Mayblossom Wilkinson related a story to me. She said that Chang Ah Gett came to the US from China at the age of 14 with a group of chinese because he could read and write. He was from a family of scholars that were stripped of their ‘title’. Couldn’t make a living so he left. He came from the same home town as Chock Sai Shee and my grandmother Gam Pang Chock (Goo Hok Chyun). They were setup in marriage by Dr. Sun Yat-sen’s brother Son Hu (Sun Mei in Honolulu?). She also relates that my grandmother was presented to Dr. SUn Yat Sen as a possible bride since our families knew each other and were from the same village… but was eliminated. http://en.wikipedia.org/wiki/Cuiheng. It is about 10 miles from Guhe or GooHok. 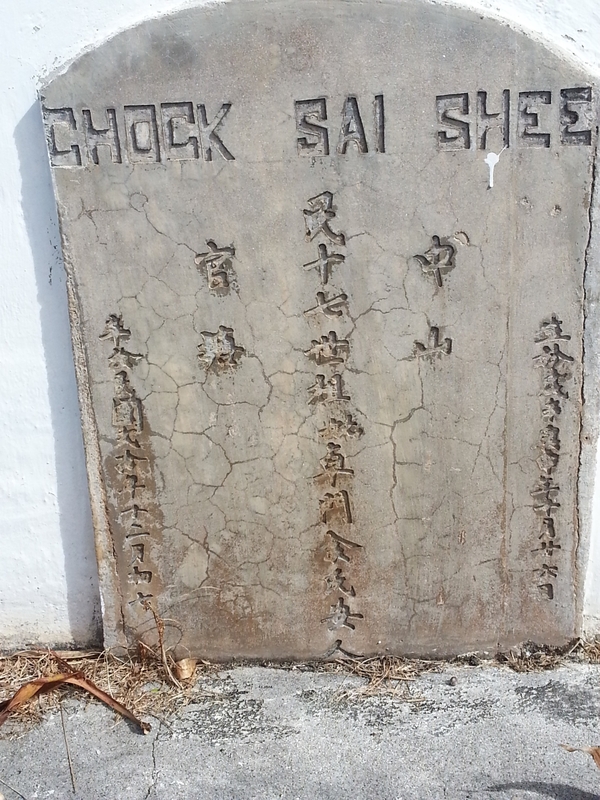 (Chock Sai Shee’s village). 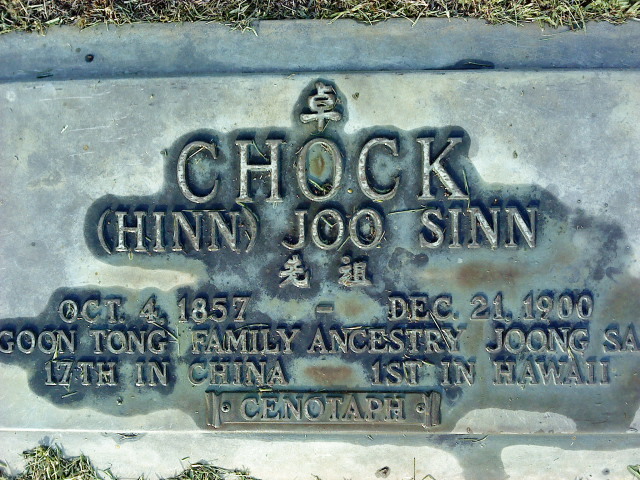 Chock’s (Cheuk) also come from Ngan hang or Yinkeng which is about 10 miles from CuiHeng.